As a Company with more than 250 employees we are required by law to publish our Gender Pay Gap Figures. 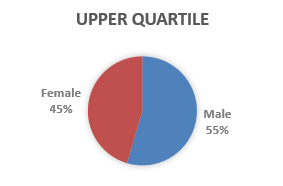 These figures show the difference between male and female average hourly pay, average bonus pay, the number of males and females receiving bonuses and the proportion of males and females in each quartile of the company’s pay structure. The gender pay gap is different to equal pay regulations which require men and women to receive equal pay for carrying out the same or similar jobs or work of equal value. The gender pay gap report shows the difference in the average pay between all men and women in a workforce. The gender pay gap calculations have been completed on the snapshot date of 5th April 2018. 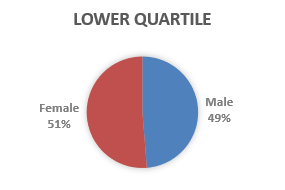 The Mean calculation is based on the average of all pay and the Median calculation is the middle rate when the figures are listed in numerical order. Our review identified that our mean hourly pay gap remains unchanged at 8% and our median hourly gender pay gap has increased to 8%. We are pleased that our gap remains lower than the average for our industry and in comparison to the gap reported nationally. Whilst more women are in roles that are eligible for performance related bonuses the median bonus pay gap result is affected by bonuses paid to men in managerial roles. 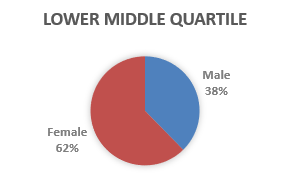 Whilst our Board of Directors consists of two males and three females the majority of roles that have formed the Upper Pay Quartile are typically male orientated roles. In particular the roles of General Managers and Head Chefs. 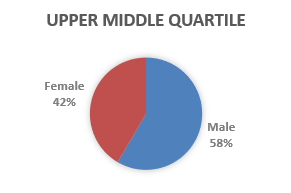 However this year we have seen a 9% increase in Female employees in the Upper Quartile. We will continue to provide opportunities to all employees regardless of gender but hope to continue in the future to promote and offer more opportunities to female employees into what are traditionally seen as male orientated roles.